Are you among those rare people? Ask Our Experts! True love is one of the rare gift of destiny that not everyone is blessed with. It is perhaps the sweetest emotion that one can experience in his/her life. Everybody wishes for true love in their life but only a few are lucky enough to have it. The ancient and divine science of Vedic Astrology reveals what the stars have in store for you as far as the love aspect of your life is concerned and remedies that, if adopted, can attract this beautiful phenomenon! We urge you to contact us to get your Personalized Love Report. Careful analysis of the Natal Chart. Study of the prime house of love in the chart. Special analysis of Venus (Planet of Love). Timings when true love can be expected. Remedies to remove hurdles on way to true love. In-depth analysis of the prime house of love reveals real situation of true love. Crucial planetary transits reveal favourable & unfavourable periods for true love. Effects of both benefic & malefic planets on love is factored. 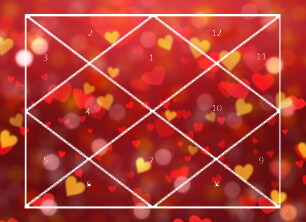 Strength of Venus in the chart measures the chances of true love. At the end, powerful remedies negate all seen hurdles to ensure true love.